At this time of year, I love nourishing myself with hot soups. 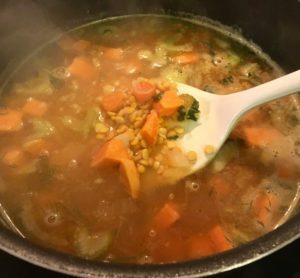 I love them because it’s cold outside, and they are warming and delicious, but also because you can jam so many great nutrients into a soup, and they are generally easy to digest. 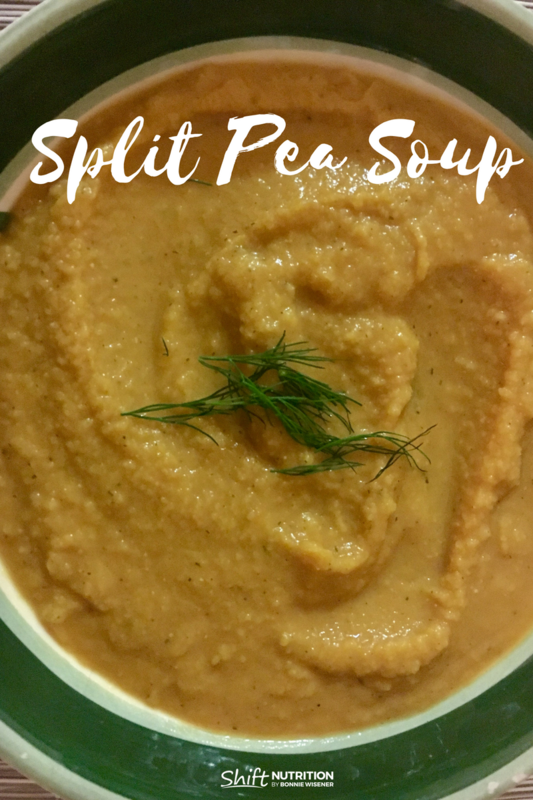 I chose to make this with yellow split peas vs. green split peas because I liked the colour better. There are negligible difference in nutrient value or in cooking requirements between the two varieties. Yellow Split Peas are an excellent sources of protein (1/2 cup dried =10 grams of protein) and fibre (1/2 cup =10 grams of dietary fiber)! This soup is a meal in itself. It’s great to bring for lunch or serve with a small salad for a filling, but light dinner. A great MEATLESS MONDAY option. 6 cups veggie stock (I used Imagine organic vegetable broth) but you could use any leftover stock you have on hand. 1. In a large pot, heat coconut oil and garlic. Add onions, and saute for approximately 5 minutes, until onions are translucent. 2. Add sweet potato, carrot, celery and cook on medium heat for another 5 minutes. 3. 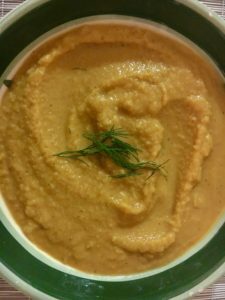 Pour dried split peas over top, add vegetable stock, salt, pepper, turmeric and cumin. Drop in chopped dill and basil. Bring to a boil. 4. Once boiling, cover and turn heat down to simmer. Allow to simmer for 30 minutes. Once cooled, blend soup using an immersion hand blender to puree. Garnish with sprigs of fresh dill and serve. Makes 10 servings. Freezes well. Freeze in small batches and defrost one at at time for individual meals.